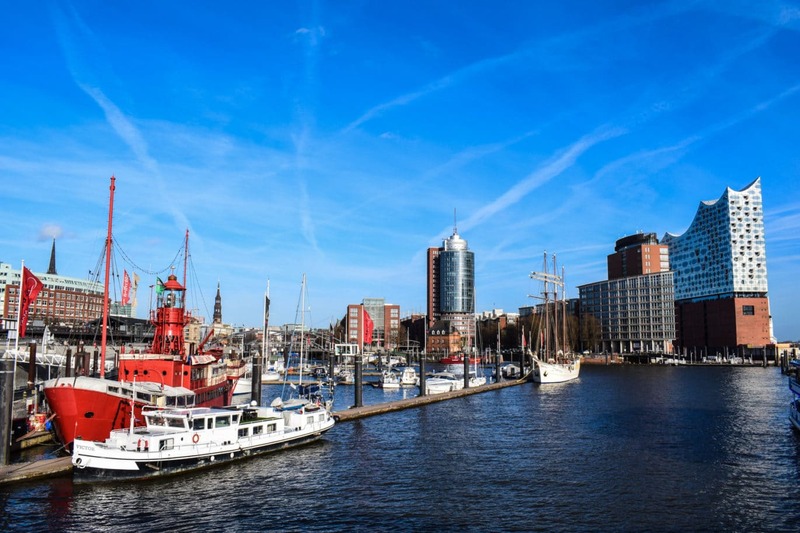 3 Days to Discover Hamburg? Our German Travel Tips Await. Hey Waddlers, L + E here. Did you know that Hamburg is the home of hamburgers? This isn’t actually true, but we like to think so. Famous for miniature cities and quintessential shots of harbour fronts, the city provided a place for Eric to practice his German phrases. His German teacher – and partner in crime – Lisa really liked him learning new words and practicing his pronunciation. If you’ve wandered in off the street and found yourself reading this, HI! We have a long and frequently asked about back story, so if you need a Monday “pick me up”, you can read how our real-life fairy tale started here. Hamburg was defined by Eric needing to get work done. While technically on a work trip, we adjusted our schedule to include more coffee shops. Here’s an Eric “get to know you” moment: he’s most productive in coffee shops. Something about the atmosphere – the sounds, the smells, the feeling of connection – that allows his wandering mind to come back to centre and focus. Right, sorry. Hamburg! If you’re looking for other Germany posts, you should check out the following posts. From great German hostels to things to know before you travel to Germany, we’ve got quite a few! Things to Do in the Capital City – Berlin! Discover Hidden Gems: Würzburg, Bamberg, Coburg and Aachen! Wiesbaden and Mainz are worth it, too! Do you like coffee? Hamburg Coffee Shops, right here! Since coffee shops were the aim, we visited a few. First up was Nord Coast – a place that doesn’t f*** around with their coffee. Want your coffee beans infused with vanilla, raspberry, or the other? Go here. Another place we ventured into on the way to the Sternschanze was called Public Coffee Roasters. A nice place to sit and enjoy a very small, quieter atmosphere. Eric had a flat white that was very well done. The final place we went was called The Coffee Shop. Believe it or not, it’s a shop that serves coffee in the main shopping area minutes from Hamburg Rathaus. We took a photo while working there and tagged them on our Instagram Story – they replied with a heart. How cheeky. The Coffee Shop is located above the Zara (like the store). Look for the entrance to the left of the main Zara entrance. Overlooking the Elbe River, it’s a great place to rest up in a cool atmosphere and enjoy the hustle and bustle of city life. 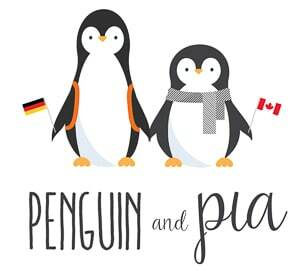 But Penguin and Pia, what did you eat? Well, the best Bavarian breakfast (or Frühstück) we’ve had while not in the south of Germany, of course! Weisswürste, pretzel, sweet mustard, the whole nine yards. Head to Wildes Fräulein to check it out. We also went to Quan Do – a Vietnamese place near the Hauptbahnhof and the main shopping area. Worth a look if you’re into simple but delicious veggies and meats and want to use chopsticks. Also if you’re looking to eat Vietnamese cuisine in Germany and be totally cool with it. Yay, globalization! Figuring that trying local beers would be a treat, we sought out a place to do a little sampling. Ending up at Barley and Malt was a great success. SUPER friendly bartender, and for only 7 Euro you get a flight of 5 beers that are all from the local area/Germany. Spoiler: One is SUPER bitter, and not in a good way. Eric likes beer hoppy, but this is next level. If you go, give them a go and comment below what you think! For classic Penguin and Pia photos, you’ll need some high elevation. We went to St. Michaelis Church, which can be described as a beautiful 17th century Stairmaster. WE say this because we climbed the steps (yes, all 453 of them) to the top. There’s an elevator, but we got excited. Plus, exercise = good. For a classic waddle, Sternschanze is a hipster areas littered in graffiti and loaded with second-hand shops, bookstores, cafes, and more. We went in March and had a blast – and we can’t wait to return in the summer and experience the patios and what is sure to be a lively atmosphere in the sunshine. Of course, the Speicherstadt, or “warehouse district” was exactly like the photographs with the classic red brick and iron bridges – really cool to wander around in person. Rating on the Penguin and Pia Scale: 8.75/10 Waddles. 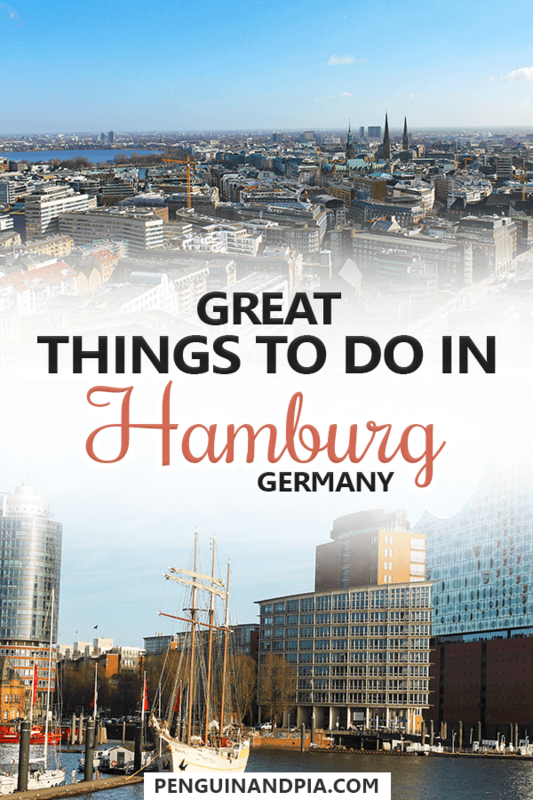 Hamburg is an incredible city with lots to do and see. The original intention was to stop through to test it out as a place to lay down a few roots in the future. As a short test for livability – it ticked basically all of our boxes. Hamburg in 3 words: Must go back.